Now you can manage the workflow of your staffing agency from a single technology platform. Simplifly removes time consuming double-entry procedures that cost you money and cause mistakes. With Simplifly, you can track workers through each stage of the process from the moment they apply to your agency to their job assignment with one of your clients. Set up your online application forms and begin tracking every recruit in your system as they move through each stage of the process. Eliminate paper forms that have to be inputted by hand at each stage. Track every employee through their job placement assignments. See an employee’s placement history and relevant skills to a given job opening at a glance. Track and manage all of your agency’s claims through the Simplifly system. Simplifly makes it easy to maintain communication, documentation, and compliance as an added layer of protection for your business. Quickly calculate your client billing through the system. Invoice your clients directly or export your data. Shave time off the task of billing your clients and focus on growing your company. Keep track of all the ways that you communicate with your clients and prospects. 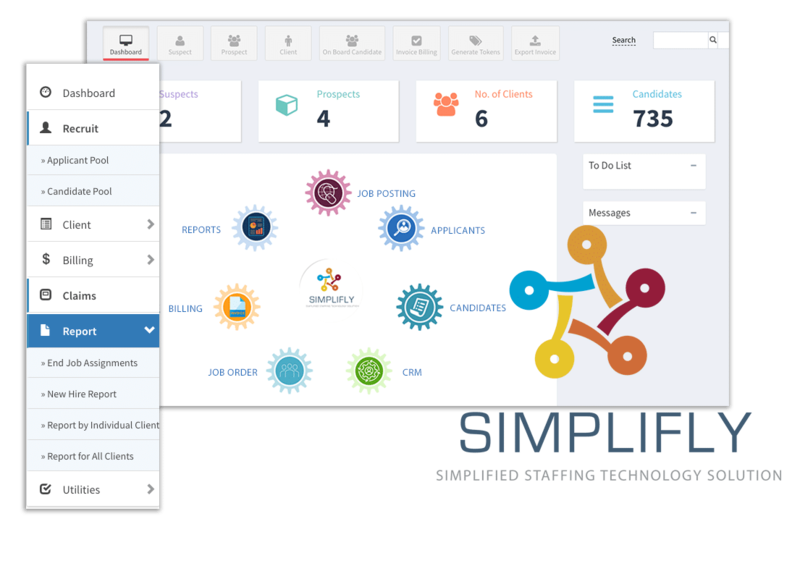 Simplifly makes it easy for teams to work together to develop and strengthen relationships with your target market.